Alendronic acid, sold under the brand name Fosamax among others, is a bisphosphonate medication used to treat osteoporosis and Paget's disease of bone. It is taken by mouth. Use is often recommended together with vitamin D, calcium supplementation, and lifestyle changes. Common side effects include constipation, abdominal pain, nausea, and acid reflux. Serious side effects may include esophageal problems, osteonecrosis of the jaw, and femur fractures. Use is not recommended during pregnancy or in those with poor kidney function. Alendronic acid works by decreasing the activity of cells that breakdown bone. 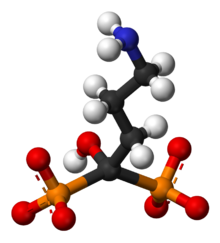 Alendronic acid was first described in 1978 and approved for medical use in the United States in 1995. It is available as a generic medication. In the United Kingdom, a month of medication costs the NHS about 0.41 pounds as of 2019. In the United States, the wholesale cost is about US$1.16 per month. In 2016, it was the 73rd most prescribed medication in the United States, with more than 10 million prescriptions. Ulceration and possible rupture of the esophagus; this may require hospitalization and intensive treatment. Gastric and duodenal ulceration may also occur. Esophageal cancer, a meta-analysis concluded that bisphosphonate treatment is not associated with excess risk of esophageal cancer. General: infrequent cases of skin rash, rarely manifesting as Stevens–Johnson syndrome and toxic epidermal necrolysis, eye problems (uveitis, scleritis) and generalized muscle, joint, and bone pain (rarely severe) have been reported. In laboratory tests, decreased calcium and phosphate values may be seen but reflect expected action of the drug and are almost always not clinically relevant. Osteonecrosis of the jaw (deterioration of the temporomandibular joint or TMJ) may occur while on this drug, if dental work of any kind is carried out. Although this side effect is uncommon, it occurs primarily in patients being administered intravenous bisphosphonates, with most cases being reported in cancer patients. Bone: alendronate has been linked in long-term users to the development of low-impact femoral fractures. Further, studies suggest that users of alendronate have an increase in the numbers of osteoclasts and develop giant, more multinucleated osteoclasts; the significance of this development is unclear. Fosamax has been linked to a rare type of leg fracture that cuts straight across the upper thigh bone after little or no trauma (subtrochanteric fractures). Food and drugs containing large amounts of calcium, magnesium or aluminium (antacids) decrease the absorption of alendronate. At least half an hour should pass after intake of alendronate before eating dairy products or taking the supplement or drug. The additional beneficial effect of HRT (hormone replacement therapy) with estrogens/progestins or raloxifene in postmenopausal women with osteoporosis remains to be elucidated, but no interactions have been seen. The combination is therefore possible, but controversial. The combination of NSAIDs and alendronate may increase the risk of gastric ulcers. Both these drugs have the potential to irritate the upper gastro-intestinal mucosa. Alendronate inhibits osteoclast-mediated bone-resorption. Like all bisphosphonates, it is chemically related to inorganic pyrophosphate, the endogenous regulator of bone turnover. But while pyrophosphate inhibits both osteoclastic bone resorption and the mineralization of the bone newly formed by osteoblasts, alendronate specifically inhibits bone resorption without any effect on mineralization at pharmacologically achievable doses. Its inhibition of bone-resorption is dose-dependent and approximately 1,000 times stronger than the equimolar effect of the first bisphosphonate drug, etidronate. Under therapy, normal bone tissue develops, and alendronate is deposited in the bone-matrix in a pharmacologically inactive form. For optimal action, enough calcium and vitamin D are needed in the body in order to promote normal bone development. Hypocalcemia should, therefore, be corrected before starting therapy. Etidronate has the same disadvantage as pyrophosphate in inhibiting mineralization, but all of the potent N-containing bisphosphonates including Alendronate and also risedronate, ibandronate, and zoledronate, do not. As with all potent bisphosphonates, the fraction of the drug that reaches the circulatory system intact (systemic bioavailability) after oral dosing is low, averaging only 0.6–0.7% in women and in men under fasting conditions. Intake together with meals and beverages other than water further reduces the bioavailability. The absorbed drug rapidly partitions, with approximately 50% binding to the exposed bone surface; the remainder is excreted unchanged by the kidneys. Unlike with most drugs, the strong negative charge on the two phosphonate moieties limits oral bioavailability, and, in turn, the exposure to tissues other than bone is very low. After absorption in the bone, alendronate has an estimated terminal elimination half-life of 10 years. ^ a b c d e f g h i j k l "Fosamax Monograph for Professionals". Drugs.com. American Society of Health-System Pharmacists. Retrieved 2 February 2019. ^ a b c British national formulary : BNF 76 (76 ed.). Pharmaceutical Press. 2018. pp. 710–711. ISBN 9780857113382. ^ "NADAC as of 2019-01-30". Centers for Medicare and Medicaid Services. Retrieved 2 February 2019. ^ Sun K, Liu JM, Sun HX, Lu N, Ning G (October 2012). "Bisphosphonate treatment and risk of esophageal cancer: a meta-analysis of observational studies". Osteoporosis International. 24 (1): 279–86. doi:10.1007/s00198-012-2158-8. PMID 23052941. ^ Haber SL, McNatty D (March 2012). "An evaluation of the use of oral bisphosphonates and risk of esophageal cancer". Ann Pharmacother. 46 (3): 419–23. doi:10.1345/aph.1Q482. PMID 22333262. ^ Pazianas, M.; Miller P; Blumentals WA; Bernal M; Kothawala P (August 29, 2007). "A review of the literature on osteonecrosis of the jaw in patients with osteoporosis treated with oral bisphosphonates: prevalence, risk factors, and clinical characteristics". Clinical Therapy. 29 (8): 1548–58. doi:10.1016/j.clinthera.2007.08.008. PMID 17919538. ^ Carini, F.; Barbano L; Saggese V; Monai D; Porcaro G. (2012-04-03). "Multiple systemic diseases complicated by bisphosphonate osteonecrosis: a case report". Ann Stomatol (Roma). 3 (2 Suppl): 32–6. PMC 3512552. PMID 23285320. ^ Lenart BA, Lorich DG, Lane JM (March 2008). "Atypical fractures of the femoral diaphysis in postmenopausal women taking alendronate". N. Engl. J. Med. 358 (12): 1304–6. doi:10.1056/NEJMc0707493. PMID 18354114. Lay summary – US News & World Report. ^ Weinstein RS, Roberson PK, Manolagas SC (January 2009). "Giant osteoclast formation and long-term oral bisphosphonate therapy". N. Engl. J. Med. 360 (1): 53–62. doi:10.1056/NEJMoa0802633. PMC 2866022. PMID 19118304. Lay summary – Washington Post. ^ Kwek EB, Goh SK, Koh JS, Png MA, Howe TS (February 2008). "An emerging pattern of subtrochanteric stress fractures: a long-term complication of alendronate therapy?". Injury. 39 (2): 224–31. doi:10.1016/j.injury.2007.08.036. PMID 18222447. ^ Shinkai I, Ohta Y (January 1996). "New drugs--reports of new drugs recently approved by the FDA. Alendronate". Bioorg. Med. Chem. 4 (1): 3–4. doi:10.1016/0968-0896(96)00042-9. PMID 8689235. This page was last edited on 8 March 2019, at 20:49 (UTC).